The Sewer Den has brought me a lot of joy over the years since its inception in 2011. I never thought I'd learn life lessons and make friends while penning stories about mutants and pizza. Lively discussions with fellow fans have created a sewer solidarity between us. It's this camaraderie that recently brought two Turtle-Powered packages to my mailbox. Package #1 is from fellow TMNT aficionado, Crooked Ninja. Like The Sewer Den, his site is a must for fans of the green machines. The two of us are continually discussing the latest TMNT buzz and enjoying each other's work. His stock has risen to Turtle Blimp-in-the-sky heights by sending me a slew of TMNT goodies. The keys to my home are boring. 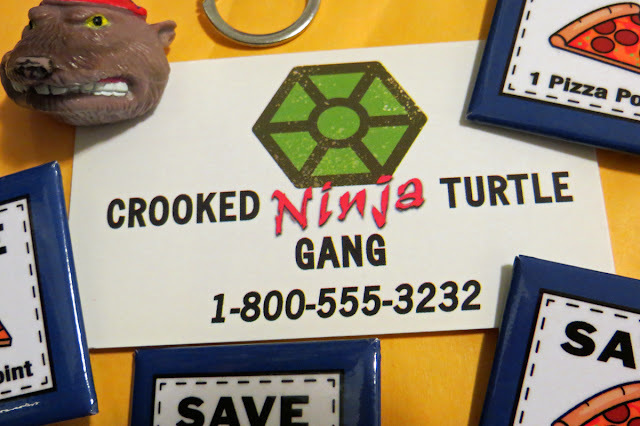 Thanks to Crooked Ninja, the mundane have mutated into amazing with this custom-made keychain. 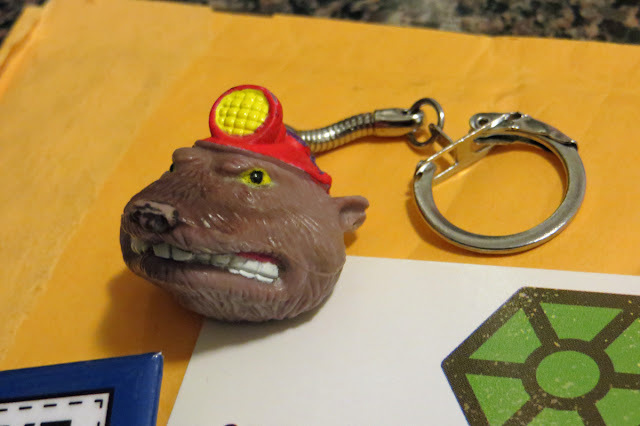 The plastic head belongs to the action figure of Dirtbag, "the militant mutant mole man!" The 24-year old toy piece (released in 1991) now takes part in unlocking the door to my home. 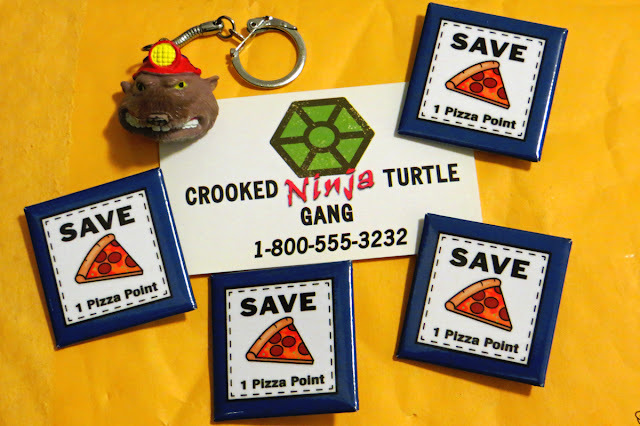 Every 90s TMNT figure included a Pizza Point, and Crooked Ninja's package was no different. But this Pizza Point is the only one that you can wear. 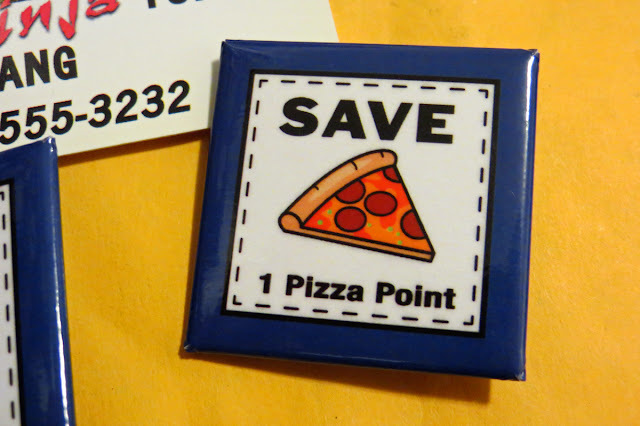 That's right, pin this baby on your lapel for a cheese and pepperoni-loaded fashion accessory. Expect to see me donning this beaut on my customary green jacket when I'm strolling conventions and other events. I'm shouting "thank you" from the sewer, hoping you can hear me, Crooked Ninja. Your envelope of mutant magic not only made my day, but elevated my keys and wardrobe to superb heights. Package #2 is from my good pal Trasufoma - a man who has his fingers in many pies. He loves TMNT, Transformers, and my personal favorite, traveling. We've bonded over our fondness for adventure and global toy hunting escapades. 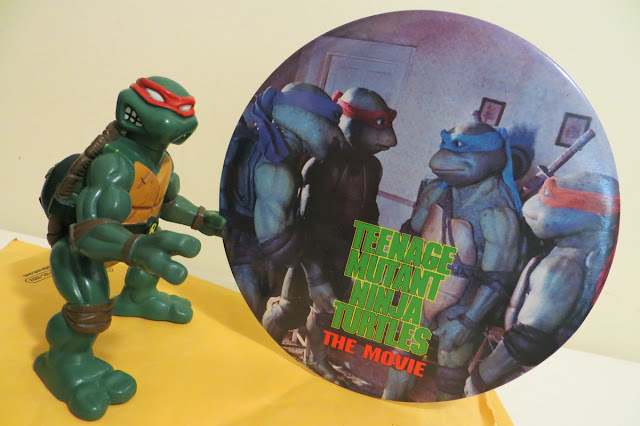 He recently stumbled upon this gigantic 6 inch button from the original TMNT film. These jumbo pins are a fun mix of awesome and absurd - a constant thread in The Sewer Den collection. Flip the beastly button over and you can get a better idea of the size. There's even a stand that pops out to keep the mammoth from toppling over (and ideal for displaying). 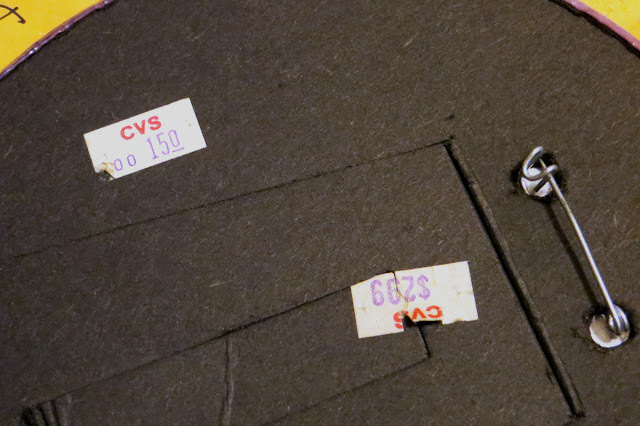 Taking a closer look at the aged price tags, you can decipher that the button was originally sold at a CVS store for $2.99, then marked down to $1.50. 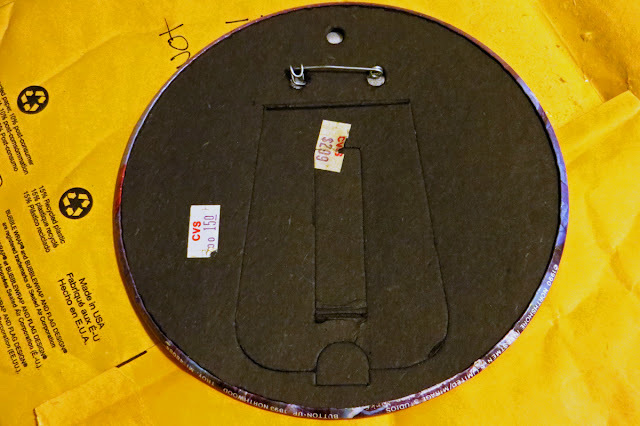 Not a bad deal for a TMNT treasure that's big enough to be a frisbee. Trasufoma's cowabunga kindness makes me a happy sewer dude. 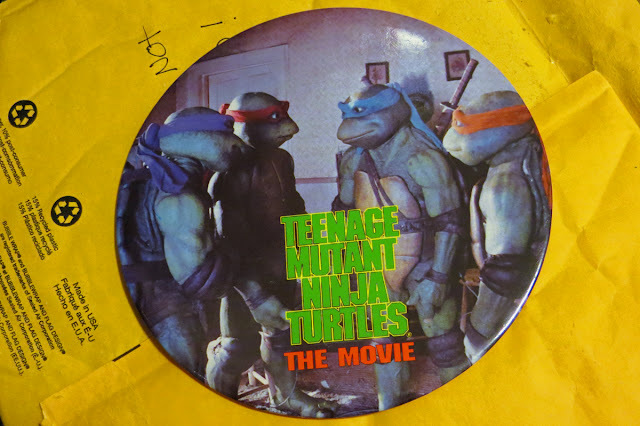 This will be a perfect addition to my TMNT button collection. To both my pals that sent me surprises in the mail, a big THANK YOU. Crooked Ninja & Trasufoma, you dudes rock. The Sewer Den is a better, more bodacious place because of you.